Ireland has improved ways in which cyclists can get to and from work safely and efficiently but we it can still be tough on the roads. The benefits of cycling far outweigh any negatives, which is why it’s so popular in Ireland right now. It provides a health benefit, it’s an ideal way to get to and from work quickly during rush hour and parking is generally easier and cheaper than for motorists. But those who commute every day know all too well that it’s not for the feint-hearted. 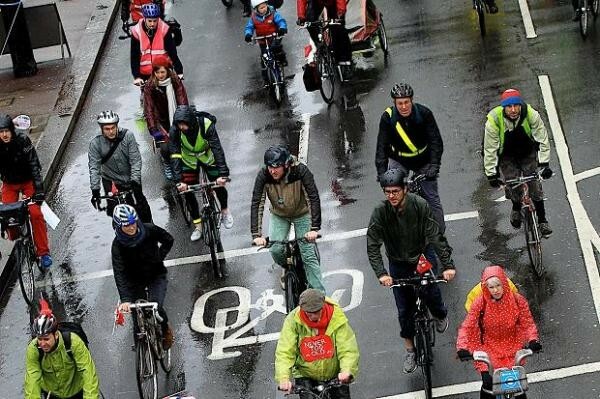 Cycling infrastructure is improving across the country and one of the most positive steps taken by various city councils in recent times has been the number of bike lanes introduced. We all know, however, that these are not just used by cyclists and pedestrians know this too. For them, it’s seen as the fast lane and a way out of their congested footpaths. Pedestrians walking on the cycle lane is simply wrong but motorists parking or driving in them is just plain dangerous. Hit the back of a car at 15kph and you’ll know about it. Hit a car door that opens without warning and you’ll probably spend time in hospital. The Dublin Bikes scheme has been a huge success in the capital while they’ve also proven hugely popular in Cork and Galway. Cyclists who commute are just like drivers who commute; always in a rush and always wanting to get there a minute quicker. But consider the fact the cycle lanes are narrow and the number of cyclists is growing. It leads to arguments and a fair ol’ bit of bickering. Cyclists who break red lights give their peers a bad name. Besides, you’re going to meet them at the next set of lights anyway so don’t be known as the ignorant one. Chances are you’ll see him or her again on the daily commute. For those who avail of city bike schemes you probably know by now the peak and off-peak times. You know when they’ll be available and when they won’t. This is all well and good until you arrive at your destination and find there’s no space left at the inn. It means you’ll either have to wait until a space becomes available, or cycle to the next station, throwing your plans up in the air. 6) When bike lanes end for no reason! You can cruise along pretty much on auto-pilot in the bike lane, knowing you are relatively safe. But as soon as you exit the sanctity that is your bike lane, you need to be far more careful. Not easy or fun if you’ve had a heavy one the night before, especially when lanes come to an end abruptly.